GBP/USD is testing the resistance at 1.3270 of the sideways consolidation yet again. A breakout above that level could lead to a further move to the upside towards 1.3340. GBP/USD dropped sharply after the news that the Bank of England has hiked the interest rate from 0.25% to 0.50% but it still hasn’t broken out below the support at 1.3030. The fundamentals tomorrow may give it the necessary push to do that. Pound / dollar had a strong bearish momentum yesterday, after failing to break above the key resistance of 1.3330, reaching a bottom at 1.3042. The commercial signals are bearish for testing the daily EMA 200, located in the 1.3000 area. This region remains a good place to buy with tight stops, as a clear break and a daily / weekly closure below 1.30 will stem the main upside trend with a potential downside reversal scenario. The closest resistance is seen at 1.3135, whose breakthrough can take the price to a neutral zone with testing at 1.3200. The British pound was up against the US dollar on Friday. By the close of US trading, GBP / USD is trading at 1.3077, gaining 0.13%. I believe that support is now at around 1.3040, the low of today’s trading, and resistance is likely at the level of 1.3321 - the maximum of Wednesday. Brexit negotiations have seen no progress so far, uncertainty of the future Brexit talks will remain pressure on Pound. Gbp/Usd is consolidating around mid level between 1.30 to 1.31, showing no directional strength short term. GBP/USD bounced off from 1.3030 again and the pair formed a double bottom at that level. There will likely be a new move to the upside towards 1.3300. The British pound recorded a neutral session against the US dollar on Tuesday. The currency pair opened at 1.3169 and the pound lost only 4 pips. Daytime extreme values ​​were reached at 1.3177 and 1.3108 respectively. If the bullish trend of the last few sessions persists, there may be a break in the first resistance at 1.3260. Pound/dollar was hesitant yesterday. The price attempted to decline, making a bottom of 1.3108, but closing higher at 1.3165. The signals are ascending in the short term for the testing of 1.3270, but the key resistance remains 1.3330. The closest support is 1.3130. A clear break below it could take the price to a neutral trading area with testing at 1.3075/50, but an important support remains 1.3000. Overall, I’m up. Gbp/usd meeting support around 1.305. Key level as this acted as major resistance in May and July this year. Descending triangle pattern formed on the daily as the pair has consolidated. This consolidation has caused it to break a clear ascending trend line (again on the daily). My long term bias for this pair is bullish but the next week or so will be interesting! Any thoughts? GBP/USD is, indeed, bullish and it will likely continue climbing next week. That said, for a further rally above the sideways consolidation to be confirmed it will have to break out above the last high at 1.3337. Gbp/Usd reacted on the news that 40 members of the PM’s Conservative party signing a letter of no confidence in Theresa May’s leadership, opened the week with bearish gap and drop to around 1.3120 level. I’m expecting further decline on Pound. 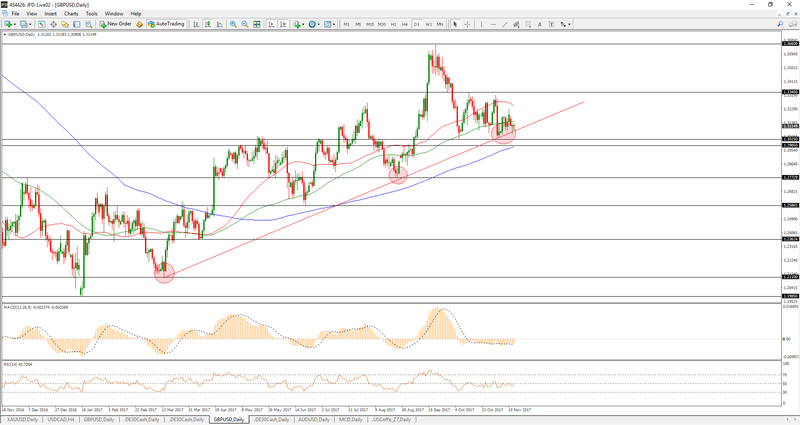 GBP/USD hit for another time the uptrend line and is expected a rebound and a retracement to the upside. However, in case of a bearish move will touch the 1.2985 support level. This pair is flip-flopping like a landed Dover sole. There are other fish in the sea. The pound lost positions against the dollar on Monday. The British currency interrupted the positive impulse from Friday and collapsed. As a result, support at 1.3071 was broken. Short-term expectations remain in favor of the dollar. The session was opened at lower levels compared to the end of last week, with the trend predominantly bearish. After the bottom of the day was hit at 1.3061 the direction was changed and the final was set at a rate of 1.3114. The pound recorded a positive session against the dollar on Thursday. The British currency continued the bullish trend since Tuesday, but a key breakthrough was not reached. Trading was open at 1.3170 and the final was 23 pips higher. The session was extremely volatile, with the difference between the highest and the lowest for the day being 71 pips. Gbp/Usd continue ranging between 1.302 and 1.325 with limited upward strength. The market continue to focus on Brexit.